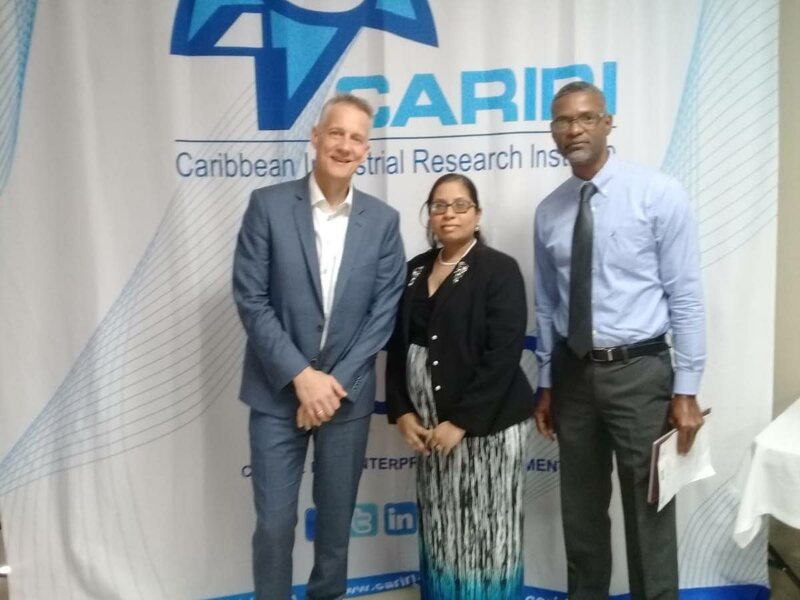 Danish Technological Institute director for ideas and innovation, Knud Erik Hilding-Hamann stands with Cariri business development officer Melissa Bissoondath and Ideas Advisory Service (IAS) project chief Hayden Charles. Have you ever sat in front of your desk, (or workshop or garage or food stand) and thought, "There has to be a better way to do this!" And then thought of a better, practical way to do that thing? Well if you have – and it’s not a hare-brained idea like spinning straw into gold – then the folks at the Caribbean Industrial Research Institute (Cariri) are willing to help you invent your dream. Cariri has developed the Ideas Advisory Service (IAS), a three-year project partially funded by the Inter-American Development Bank, which “gives persons, individuals and companies that have innovative ideas a vehicle to take that idea to commercialisation” through a project called Bridging the Gap to Commercial Application of Innovation. Cariri has entered into a one year contract with the Danish Technological Institute to develop ideas into sustainable projects. Business Day sat down with IAS project chief Hayden Charles, business development officer Melissa Bissoondath and Danish Technological Institute director for ideas and innovation, Knud Erik Hilding-Hamann at Cariri’s Freeport offices to discuss the project. Charles said the project comprises two phases. The first is sifting through ideas submitted and “look at the innovativeness and protectability" of the idea. "We also look at the marketing of the idea to see whether there is a market out there for a solution or there is a problem to be solved, and if people would be interested in acquiring that solution,” he said. Then you have to create a pretotype. A pretotype is partially mock-up of the intended product or service that can be built in a short time. It's a little less expensive than a prototype, and it’s a demonstration model to help to showcase the idea and to test it within the market with the least cost or time spent on developing it. If the idea at that stage seems viable and has potential, then people in the programme can move onto the second phase, aimed at making the idea commercial. There are two parts to bringing the product to commercial viability. First, the individual or business can choose to bring the product to market themselves, or alternatively, they can license the product, using another company's resources and networks, and instead, get royalties from the sale of the product. About 200 ideas were submitted, Charles said, and have now been whittled down to 65 ideas in the ICT, food, manufacturing and household goods sectors. “This is a vehicle that can help with diversification,” he said. Bissoondath said one of the project’s success stories was an idea from a Tobagonian seamstress who created a collapsible ruler to replace the several separate ones she previously used – and includes a calculator. Cariri’s role, then, was to source a company that would be interested in producing and marketing this product. She said after extensive research, a Danish company was selected, with a licensing agreement signed this year. She said the company would begin sale and distribution of the ruler in Europe later in May. “It took about two years to get a licence agreement executed. We have to do research and the inventor has to be comfortable and involved in negotiations,” Bissondath said. Hilding-Hamann said the institute has done this kind of work for the past 40 years and has licensed over 281 products. Asked if there were differences in the ideas generated in TT as opposed to Denmark, he said while there were no perceptible differences, there is a lack of trust in TT. Protecting the idea is important and inventors can use non-disclosure agreements, patents or use trademarks to safeguard product, he added. For example, before they even started working with Cariri, inventors would sign a non-disclosure agreement. “In Denmark they do not do that. Inventors would just come to us and trust us,” Hilding-Hamann said. He said none of the ideas received were based on the oil and gas sector but were focused on food, ICT, household goods and manufacturing. Bissoondath said Cariri would would help innovators determine whether their ideas are feasible by performing a market survey on if there is a demand for their product and whether they should pursue its development. Reply to "Hitting the innovation mark"